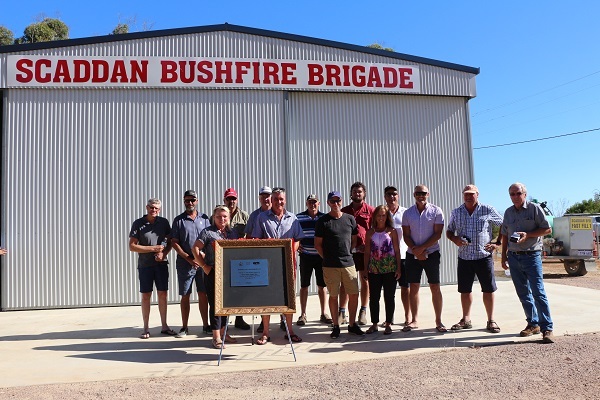 The Scaddan Bushfire Shed was officially opened on Friday 2 February 2019. Minister for Emergency Services the honorable Francis Logan MLA, WA Member for the Agricultural Region the honorable Darren West MLC, Fire and Emergency Services Commissioner Darren Klemm, Shire of Esperance President Victoria Brown, Shire of Esperance CEO Matthew Scott, attended and unveiled the plaque to officially open the Scaddan Bushfire Shed. This two bay facility has been a project undertaken over the last 18 months to give the Scaddan Bushfire Brigade a base to store their appliance, associated equipment and a place to meet and undertake training from. With two Bays it will allow for any expansion in the future, give the brigade a base from which to operate and coodinate their work. Chief Bush Fire Control Officer Ashley Stewart and Scaddan Bushfire Brigade Captain Gavin Egan used the occasion to recognize the voluntary service of its longer serving members; 26 members of the brigade were presented with 10 year service medals; 4 of these were further presented with their National Medal; two with their 15 year clasp and two with their 20 year clasp.